Footy in Bakersfield, California, pretty much came to a standstill in the second half of 2006 as Barbarians founder Leigh Hickling was unable to dedicate as much time to the game. He remains keen to keep the sport alive in the inland city of 300,000 people (with around 400,000 more in the greater surrounding area of Kern County), but with a small player base thus far, it was a tough year for the fledgling club. WFN has followed the ups and downs of Bakersfield since Hickling started the team in early 2005. Our dedicated page the Bakersfield Experiment was designed to give new sides an idea of the trials and tribulations they might face. 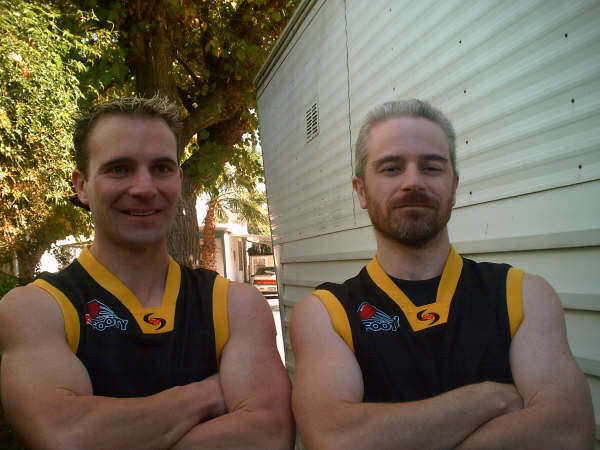 Besides family health issues, Hickling has also been up against the distance of Bakersfield from other footy clubs in the US, and the low number of expat Aussies in the town. Still, he has received support from several west coast sides, and he intends contacting the SOCAL league to find a way for his players to get exposure there. He hopes to get his players back on the track in February. Hickling may also be asking USFooty to waive any fees for the year, since their numbers are still very low. It's a tough task getting a new club going in such an area, and Hickling (pictured with his brother who visited him recently) is realistic and says "It will take time, but I am going to see it through til the end" and "We still have plenty of work to be done, but I still have a good core of players wanting to play".